Modern society values both health and beauty, and showing off your pearly whites can be a first impression of both. However, if these pearly whites become yellow or stained, options are available to bleach or whiten your teeth. A common ingredient in professional and home teeth whitening products is hydrogen peroxide, a substance that has a bleaching effect so that your stains are not as pronounced. 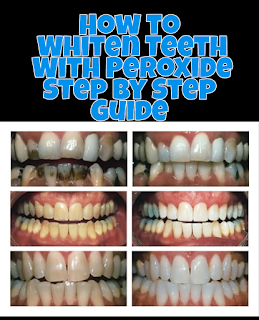 This may explain why hydrogen peroxide is a longstanding and popular teeth-whitening home remedy. While the 3 percent hydrogen peroxide commonly found in the brown, plastic bottles may take more time to work compared to the highly concentrated peroxide gels used by dental clinics, these lower concentration solutions are the only ones considered safe for home oral rinses. Brush your teeth as usual with toothpaste. Rinse thoroughly with water. Set the toothpaste and toothbrush aside. Pour a small quantity of hydrogen peroxide, less than 1/4 cup, into a fresh rinsing glass. Make sure the concentration you purchase is 3 percent or less. If you have sensitive teeth or gums, dilute the hydrogen peroxide with water. Swish the solution around the entire mouth for approximately 1 minute, being careful not to swallow any of the peroxide. Spit solution into the sink and rinse it down the drain. As an alternative, or in addition to rinsing and spitting, dip a clean cotton swab into the peroxide and rub it along the tooth surfaces. This technique cannot get into the spaces between teeth, but it can be useful to increase the whitening of visible surfaces. Rinse thoroughly with plain water, again taking as long as a minute to completely rinse the peroxide out of your mouth. Spit water into the sink and rinse the sink with water. If bubbles are felt fizzing between or around the teeth, rinse again until the peroxide is completely removed. Repeat daily. You may begin to see results in 2 weeks. After an acceptable degree of whitening has been achieved, discontinue daily peroxide use in favor of weekly sessions. Hydrogen peroxide is fairly unstable and will break down over time, particularly if exposed to light -- rendering it ineffective. So use a fresh bottle if you aren’t sure how long yours has been around. According to the American Dental Association (ADA), consult with your dentist before beginning a home teeth-whitening program, especially if you have dark stains on your teeth, crowns, many fillings, gum disease or sensitive teeth.